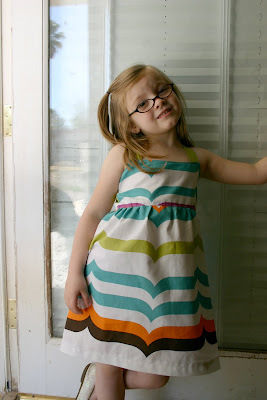 Last night while watching Project Runway, I decided to get all designerly myself & started making Sadie a dress without a pattern. I had it in my mind & just had to work through it & get it out. It's not perfect, but I'm happy with it. She didn't want to stop watching TV so that I could take a photo. Ha ha! The fabric is from a tapestry bedspread that I bought on clearance at Target from their dorm room line a while back. I used elastic in the back so that she could get it on & off easily. By the way, the notions wall is on sale 50% off at Joann's right now. I like to stock up on elastic whenever this sale comes up. I got a bunch of 1" no roll elastic for 50 cents a yard. I use elastic in skirts & pajama bottoms so it's good to stock up on. And because I had the fabric out & in only takes about 20 minutes, I whipped up a little skirt for Claire in the same fabric. 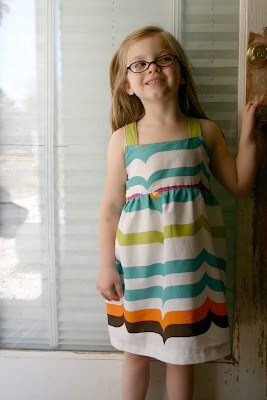 They get really excited about the clothes that I make them & it makes me feel super happy. LOVE the fabric choice. Unexpected color combos (read: anything not pink) on girls is my favorite! 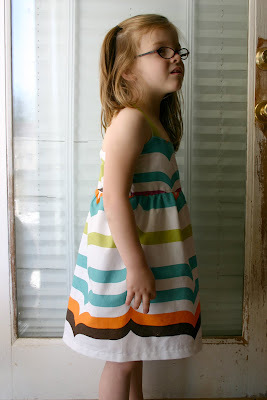 great fabric, super cute dress and skirt! love the retro feel. good job! i can't wait to make some skirts and dresses for my babe this spring! love the fabric! that's my favorite part about handmade things -is the super unique fabric you can use! cute fabric! i love them both. Very cute! What great fabric. Don't you love finding fabric in unconventional places? they turned out great :) inspiring. I love the dress and skirt!! I never think to use sheets for dresses but I should start because I love that fabric on your girls. 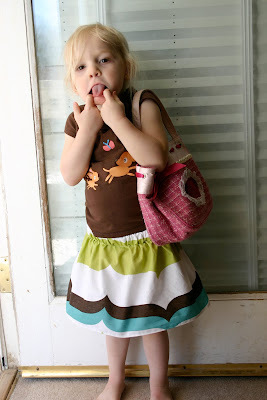 And I have to say bothe Sadie and Claire are such mini Candace's. I love Claires silly face it makes me laugh because its like I'm staring at a miniature you making that face! Your sewing is really an evolution. I love these! Great fabric choice... I always seems to find great prints in bedding that I'd much prefer wearing as clothing rather than sleeping on or in... your girls are beautiful little versions of you! Love your blog, you are a very inspiring crafter! so cute . . . i love that fabric!!! you make such pretty stuff, and you kill me that it takes 20 minutes to whip that up! you need to recognize you have MAJOR talent in the sewing department. and you're lucky they get so happy about your makings, my girls are so blah about it. love the look of this whole thing. So cute....this is my first time checking out your blog thanks to VandCo...but I have 3 girls 5yr old, 3 yr old and 6 month old...I am always looking for new ideas of cute things to sew (even though I am a terrible sewer...but these are adorable...i might just have to give them a try.